This year marks 10 years since Mark Fenwick began working on his modern vision for Albania’s national stadium. Since then Albanian football authorities managed to scrap that design, commission a new one and scrap it as well. So, will third attempt be successful? Let’s see, because this week FSHF presented that third stadium concept. 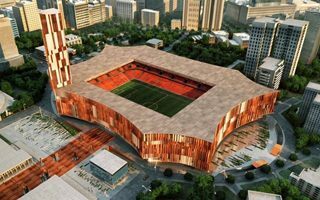 Just like the previous ones, it foresees demolition of the aging Stadiumi Qemal Stafa and erection of a football-specific venue for 22,300 people on two tiers of seating. That’s a decrease from previous plans, which considered capacity of 30,000, possibly more. This change is no surprise, because 22,000+ is a more fitting size for domestic demand and available space. It also doesn’t stop the stadium from gaining UEFA Category IV and possibly hold even the UEFA Supercup game. The design by Italian office Archea (recent works include Dacia Arena in Udine) is very vivid and sharp, both in form and colour. Vertical lines allow for a smooth incorporation of the skyscraper in north-western corner. Also, the west is connected by a plaza with existing Archeological Museum. All of the above sounds more than fine, especially with Albania’s stadium issues in recent years. But why should we be optimistic about this vision being implemented if previous ones ended abandoned?